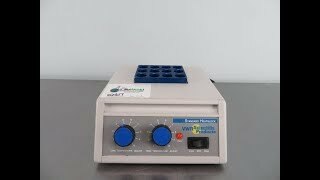 The VWR Analog Dry Heat Bath provides a consistent dry heat solution for heating a wide variety of test tube sizes. This heating block uses interchangeable aluminum blocks for excellent conductivity and uniformity throughout. This dry heat bath maintains a temperature range of up to 150°C (302°F), with both high range 75° to 150°C (167 to 302°F) and a low range covers ambient to 100°C (212°F) with knob controls for each. This VWR Analog Dry Heat Bath has been fully inspected and maintained its set temperatures without issue. All of our lab equipment comes backed with our standard warranty. Should you have any questions, please don't hesitate to contact us.